Tennis duo of Mahesh Bhupathi and Leander Paes failed to give India its second medal here last night as they went down fighting to Croatian pair of Mario Ancic and Ivan Lubjicic 6-7, 6-4, 14-16 in a gruelling three-hour-58-minute encounter. Leander Paes spoke of a "hollow" feeling having gripped his partner Mahesh Bhupathi and him after the duo suffered a heart-wrenching defeat in an epic bronze medal playoff that ran well past midnight. "It is a huge disappointment. We are feeling a bit hollow at the moment," said Paes after the defeat. India’s KM Binu started poorly and finished a distant seventh in his semifinal heat in the men’s 400 metres and made his exit from the event in the Olympics here tonight. Binu, drawn in lane 2, made a sluggish start and was trailing far behind the front runners on the back straight. He made a determined effort just before the final bend to outstrip Matija Sestak from Slovenia in lane number one. Rajyavardhan Singh Rathore returned home to a tumultuous welcome, accorded only to heroes, today and praised the system for making him a shooting star overnight, as it were. Women's world No 1 Justine Henin-Hardenne of Belgium staged an amazing comeback to beat French Open champion Anastasia Myskina of Russia 7-5, 5-7, 8-6 to reach the Olympic tennis gold medal match. The 22-year-old Belgian, who has spent most of the year battling a debilitating virus, will play second seed Amelie Mauresmo of France, who beat Australia's Alicia Molik 7-6 (10/8), 6-3 in the final. American swimmer Michael Phelps won an Olympic record-equalling eighth medal at the Athens games today when the US team took gold in the men’s 4x100 metres medley relay. The 19-year-old, who did not swim in the final but won a medal by virtue of having taken part in the heats, now has six gold medals and two bronze medals to match Soviet gymnast Alexander Dityatin’s 1980 record for the most medals at one games. India’s hopes of regaining their awesome batting form of the past season were heavily dented after they failed to overhaul a stiff target and crashed to a 66-run defeat to arch-rivals Pakistan in the opening match of the triangular one-day cricket series here today. India received a big jolt today in their quest to win the tri-series here with batting mainstay Sachin Tendulkar being ruled out of the tournament due to a ‘tennis elbow’. “Tendulkar will not be participating in any of the matches of this tournament due to an acute onset of tennis elbow,” Indian team manager Gautam Dasgupta announced here. England hammered West Indies by 10 wickets inside three days to win the fourth Test at the Oval on Saturday, claiming a 4-0 series whitewash and a record-equalling seventh consecutive test win. Bula Chowdhury, who became the world’s first woman to conquer the seven seas, today said she had no intention of calling it a day and wanted to continue to rule the seas, crossing more channels across the globe. Rohtas Singh, Ali Sher, Gaurav Ghei and the late Surender Lall, father of lady golfer Nonita Lall, who helped shape the destiny of Indian golf, were honoured by Amby Valley Sahara Lake City, the new umbrella sponsors of the Indian PGA Tour. Defending champions Jharkhand converted most of the chances that came their way to rout Madhya Pradesh 8-1 in the first quarterfinal match of the 17th Dhanoa Sub-Junior National Women Hockey Championship at the Guru Nanak Stadium here today. A one-day orientation workshop with regard to special Olympics was organised by Special Olympics Bharat, Punjab Chapter, today at Navjivini School of Special Education hear here. After a gap of 52 years India was in line to win more than one medal in the Olympic Games. Leander would have become the only Indian sportsman to win both the individual and team bronze medals had they won. 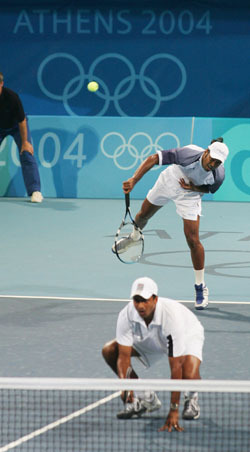 Mahesh and Leander had lost to famous Australian duo of Woodies in Atlanta as well as Sydney in the preliminary rounds. The previous best performance was in Barcelona where Leander and Ramesh Krishnan had lost in the quarterfinals. Leander, the singles bronze medallist in Atlanta, did not qualify for the singles here. Indians won the toss and elected to serve first. Leander served with venom, winning his service game with an ace. Indians met with immediate success as Mario Ancic, 30-40 down, served a double fault to give them a break. Mahesh held his service game as India raced to a comfortable 3-0 lead in just seven minutes. Ljubicic, however, held his service as both Mahesh and Leander tried to unnerve the Croatians with deep lobs but lacked accuracy. Indians, who had service problems, ran into trouble in the seventh game, when Mahesh serving 0-30 had a double fault and lost the game. Ljubicic made it 4-4. Leander served with venom to make it 5-4. Mario retained his service game to make it 5-5. Ljubicic was under pressure with both Mahesh and Leander scoring off him. The bald Croatian came back strongly, serving two aces to make it 6-6. In the tie-breaker, Indians squandered a 5-2 lead to lose 5-7. In the second set, score continued with service games till the Indians broke Ancic's second service game to take 4-3 lead. Ljubicic was lethal with his serves and won a love game. Mahesh, thanks to some excellent volleys at the net by Leander, held to give India the second set 6-4. The final set alone lasted two hours and nine minutes as the contest stretched well past midnight. The complexion of the match turned in the third set as Paes rediscovered his reflexes and began to dominate the net. In the final set, India once again broke Croatians' service early to take a 2-1 lead as Ljubicic lost his service for the first time in the match. But a weak serving game by Bhupathi allowed their rivals to come back into the match and from there on the intensity on the court only kept going up with each point. It was as late as in the 14th game that Paes uncorked the first Indian ace. The pair had their best chance in the 29th game when Ancic went down 0-40 on serve. But the sheer talent of the 20-year old helped the Croatians get out of the hole. On the 30th game, Paes began with a double fault and a couple of unforced errors later, it was all over. Leander Paes spoke of a "hollow" feeling having gripped his partner Mahesh Bhupathi and him after the duo suffered a heart-wrenching defeat in an epic bronze medal playoff that ran well past midnight. "It is a huge disappointment. We are feeling a bit hollow at the moment," said Paes after the defeat. "We were aiming to win a gold for the country and now we would be returning without any medal," said Paes, despair writ large on his face. India's Davis Cup hero even said he was willing to accept the blame for the defeat as it was his return volley, that crashed into the nets, which gave victory to the Croats. "It was my fault. These things happen in sport and we have to accept it. We gave it our best shot but unfortunately we could not get the medal," said the 31-year-old. His 30-year-old partner Bhupathi was equally devastated by the defeat. "It is very disappointing. We had prepared very hard for the Olympics. Winning an Olympic medal was a dream... but now we will go back without anything," he said. On the match, Bhuapthi said, "we started off very well but could not capitalise on the chances". India’s KM Binu started poorly and finished a distant seventh in his semifinal heat in the men’s 400 metres and made his exit from the event in the Olympics here tonight. Binu, drawn in lane 2, made a sluggish start and was trailing far behind the front runners on the back straight. He made a determined effort just before the final bend to outstrip Matija Sestak from Slovenia in lane number one. The 24-year-old Indian crossed the line in a slow 45.97 seconds and lost the chance to become only the fourth athlete from the country to advance to an Olympic track final. Binu had set a new national record of 45.48 in the first round while making it to the semifinals. The previous mark stood in the name of Paramjit Singh since 2000. He had qualified for the semifinals after finishing third in his first round heat as one of the eight fastest losers. The only Indian men to have figured in an Olympic track final are Milkha Singh (1960), GS Randhawa (1964) and Sriram Singh (1976). However, no other Indian shone in athletics. 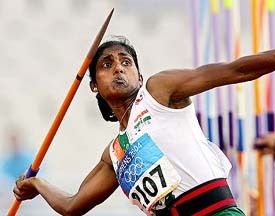 Heptathletes JJ Shobha and Soma Biswas were lagging far behind the leaders after five out of seven events with a tally of 4560 and 4273 points, respectively. The Indian challenge in archery also came to an end when the men's team went down tamely to fancied Australia in the pre-quarterfinals. Satyadev Prasad, Tarundeep Rai and Majhi Sawaiyan fought in the first two series before losing steam and provided an easy passage to the Australians. The Aussies, ranked No two in the world, won 248-236. Vikas Gowda, competing in group B of the preliminaries, finished 15th while Anil Kumar failed to register even a single legitimate throw in his three attempts in group A.
US-based Gowda was nowhere near his personal best of 64.35m achieved in the run-up to the games and could only manage a best throw of 61.39m on his second attempt to finish eighth in his group. Only three athletes, Robert Fazekas of Hungary, Virgilijus Alekna of Lithuania and Aleksander Tammeret of Estonia, could cross the automatic qualification mark of 64.50m while the remaining nine spots in the final were filled on the basis of the next best throws. But the major disappointment came from Kumar, who became the second Indian thrower after Bahadur Singh in shot put to fail in all the three attempts. The 29-year-old fouled on the first two attempts and then did not take the third. In the women's discus throw yesterday, none of the three Indians — Harvant Kaur, Seema Antil and Neelam Jaswant Singh — could qualify for the finals. Rathore, who shot a silver in double trap at the Athens Olympics to etch his name among all-time sporting greats, arrived at the Indira Gandhi International Airport here today morning, after a 10-hour flight from Athens, to be met by hundreds of cheering, mobbing fans. Union Minister for Youth Affairs and Sports Sunil Dutt and the family members of Rathore were present to receive the sporting icon, who has provided the only silver lining to the otherwise dismal streak by the Indian sportspersons. “I am feeling great because the entire country is happy about it (his winning an Olympic silver)”, Rathore remarked as he stepped out of the terminal building. The strain of being an Olympic silver medallist was telling on his face, but he managed to keep a pleasant countenance as fans besieged him, with the sounds of drums and symbals creating a cacophony of sounds. Amidst all this commotion, his wife Gayatri and their two kids waited patiently for the crowd to clear before they could get close to the Olympic hero. He was whisked off in an Army gypsy from the airport to his residence at the Delhi Cantonment area for him to freshen up and change into Army uniform to keep up an appointment with Army chief General N.C. Vij at noon. In the evening, Rathore and his family have been invited to dine with vice-president Bairon Singh Sekhawat. Slowly and surely, the importance of being an Olympic silver medallist is sinking in on him, as many more functions have been lined up to fete and felicitate the Olympic hero. Cash awards are also rolling in, and the Army chief was the first to open the account when he presented a cheque for Rs 10 lakh to Rathore. “I don’t see any change in my life”, Rathore declared, with his trademark modesty very much in place. “Three cheers for India”, he repeated the refrain he had mouthed at Athens after shooting the silver. “We have the capability, it’s a question of determination”, Rathore observed. He said there was a feeling of relief “as soon as I fired the last two shots (bang on target at Athens). Now, it’s a feeling of rejoicing”. Rathore gave full credit to the sports system in the country for helping him soar to Olympian heights, literally (The Markopoulo shooting range in Athens was carved out of a hillock). “The Sports Authority of India, the Sports Ministry, the National Rifle Association of India and the Indian Army have played vital roles in my success”, Rathore remembered gratefully. “There are very positive people in these bodies who believed in me, in my ability to make it big”, Rathore noted. Though the system is good, Rathore felt that “the system needs further improvement”. He said there will be no let up in his training programme. “But I have to work out my future. I will continue working. I may shoot or I will be helping others train for the 2008 Olympics (at Beijing). Whichever is the case, India will be gaining”, he observed. At the felicitation function by Army chief N.C. Vij at South Block, 32-year-old Major Rathore, serving with 9 Grenadiers, declared that “no one in the Army can ever settle for the second best. It will be too early to give me a silver title. There are more Olympics to come”. 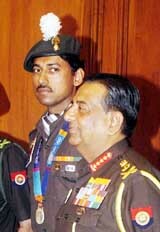 Rathore, who began his military life at the age of 16 as an NDA cadet, got high praise from the Army chief. 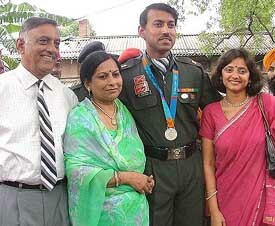 “Maj Rathore has not only made the Army but the entire nation proud. This will inspire a lot of people to emulate such feat”, Gen Vij said. Rathore said winning the silver at Athens was a very special moment for him. Reliving those killing moments at the Markopoulo range, Rathore said there was tremendous pressure on him when he shot in the medal round. "I perform well under pressure. But the pressure became a bit too hot when I lost focus in the second round (of 50 shots)”. “Though it was windy I shot well in the first round. In the second round, I lost focus and missed some shots” Rathore said, adding that in the third round “I could have done better but for the problem with the referee”. “There was some snag in the scoreboard, and the referee stopped the action to do up the board when I was about to shoot”, Rathore recollected. He said when he faired badly in the second round, he felt that all his hard work over the years was going down the drain. Gold winner Ahmad Al Maktoum, the billionnaire Sheik from the UAE, was in deadly form as he had a score to settle for his defeat at the (guns!) hands of the Indian Army Major at the Masters Cup in the Czech Republic a month earlier. “If I had let him win at the Masters Cup, Maktoum would not have been that charged up in the Olympics”, Rathore surmised. But Maktoum is an outstanding shooter who once was a world ranked squash player, and who had bested Rathore in many a shoot out in the past one-and-a-half-years, at various ranges in the world, including the Commonwealth Championship in New Delhi last year, where he had attained the Olympic qualifying norm. Rathore said it was no mean feat to see three Indian shooters in the final (Suma Shirur and Abhinav Bindra were the others) which showed that shooting was on the upswing in the country. Gagan Narang shot well too, but was unlucky to miss out a slot in the final by just one point. He said competition was the key to perfection. He averred that apart from facilities, more opportunities should be created for competitions to help the shooters improve their skills. “If there is competition, you improve”, Rathore opined. He said it helped him immensely by training in Italy, considered to be the toughest place in trap shooting, under Italian coach Luca Marini. Rathore beat his coach several times and the coach was confident that his pupil would do well at Athens. Rathore said he had carried out some changes in his gun just 10 days before the Olympic competition, and his Perazzi did not let him down at the Olympic range. Women's world No 1 Justine Henin-Hardenne of Belgium staged an amazing comeback to beat French Open champion Anastasia Myskina of Russia 7-5, 5-7, 8-6 to reach the Olympic tennis gold medal match. The 22-year-old Belgian, who has spent most of the year battling a debilitating virus, will play second seed Amelie Mauresmo of France, who beat Australia's Alicia Molik 7-6 (10/8), 6-3 in the final. Henin-Hardenne served for the match at 5-4 up in the second set and fought back from 1-5 in the third to win a pulsating match in two hours 44minutes yesterday. "I think I lost the match," said Myskina. "I mean, if you're 5-1 up you have to finish the match, no matter what. "Justine started playing a little bit better but I just played her game. I was too far from the baseline. That's why I lost." The USA broke the men’s 4x100m medley relay world record when they clocked 3:30.68 in the final. Inge de Bruijn of the Netherlands won the women’s 50 metres freestyle final at the Olympics today to defend the title she won in Sydney four years ago. The Dutchwoman powered down the pool in 24.58 seconds, just outside her own world record of 24.13, to collect her first Olympic gold in Athens and the fourth of her career. Malia Metella of France finished second in 24.89 while Australia’s Libby Lenton finished third in 24.91. Jodie Henry and Petria Thomas both collected their third gold medals at the Olympics when Australia won the women’s 4x100m medley relay in world record time today. Henry and Thomas teamed up with backstroker Giaan Rooney and breaststroker Leisel Jones to win in a time of three minutes 57.32 seconds, breaking the world record of 3:58.30 set by the USA at the last Olympics. The USA finished second in 3:59.12 after Natalie Coughlin gave them a handy lead after the backstroke leg while Germany finished third in 4:00.72 to earn the bronze. Russia pulled former women’s world superheavyweight champion weightlifter Albina Khomich from the Athens Olympics today after she tested positive for a banned steroid, Russian team officials said. Further action regarding her career would not be taken before the second set of results was known, he added. But since she was due to compete in the over 75 kg class later today, she had been withdrawn from the Games. Khomich, who turns 28 on Tuesday, had tested positive for the steroid methandrostenalone, one Russian Olympic source said. She won the world title at Antalya in 2001 and has finished second in the class in the past two world championships. At least eight other weightlifters have been hit by doping bans during the Athens Games. ATHENS: A South Korean TV technician accredited at the Olympics drowned late on Friday night while swimming in an Athens seaside suburb, police sources said. The batting-friendly conditions of the picturesque VRA ground in Amstelveen failed to inspire Sourav Ganguly’s men who, chasing a target of 194 in 33 overs, were all out for 127 with more than seven overs to spare. For Pakistan, the victory reconfirmed their Asia Cup win over the Indians whose star-studded line-up was pummelled into submission for the second time. The Indians, without the services of meastro Sachin Tendulkar after being ruled out of the entire series due to a tennis elbow, had only themselves to blame for the disaster as top batsmen Sourav Ganguly (25) and VVS Laxman (37) failed to build on their starts and the rest of the wickets fell in a heap. Shahid Afridi’s leg-spin caused havoc in the Indian innings as he picked up four wickets for 20 runs and Shoaib Malik, the off-spinner, conceded only 18 runs to claim three scalps. Earlier, Shahid Afridi (19) set the tempo by hoisting Pathan over long-on in the very first over. He then slammed two boundaries off Ajit Agarkar but the Mumbaikar had the last laugh as the cavalier batsman fell in the same over, top-edging a full-length delivery for a well-judged catch to Mohammad Kaif at cover. The Pakistani inning then revolved around middle order batsman Shoaib Malik who struck 68 off 67 balls and shared a hurricane 64-run partenership for the fourth wicket with vice-captain Yousuf Youhana (28). Fall of wickets: 1-22, 2-52, 3-58, 4-122, 5-136, 6-136. Bowling: Pathan 7-0-57-0; Agarkar 7-0-40-1; Balaji 7-1-27-3; Ganguly 6-0-34-0; Kumble 6-0-32-1. Fall of wickets: 1-30, 2-69, 3-70, 4-96, 5-98, 6-116, 7-123, 8-123, 9-124. India received a big jolt today in their quest to win the tri-series here with batting mainstay Sachin Tendulkar being ruled out of the tournament due to a ‘tennis elbow’. “Tendulkar will not be participating in any of the matches of this tournament due to an acute onset of tennis elbow,” Indian team manager Gautam Dasgupta announced here. Tennis elbow is a term used to describe pain and inflammation in the region of the elbow joint. Tendulkar had complained of stiffness in the elbow while practising for long periods at home but thought the discomfort was minor. Unfortuantely, on arrival here in Holland, the stiffness and pain did not settle down and, in fact, got aggravated at his first net session. Team physiotherapist Andrew Leipus has advised the champion batsman to undergo conservative treatment and rehabiliation. An independent medical opinion taken in Amsterdam also supported this rehabilitation programme. The results of the initial physiotherapy treatments are promising and the Indian team management hopes to have him ready for the NatWest Challenge against England in the first week of September. Opener Dheeraj Jadhav struck a fine 89 to propel India A to a six-wicket win over Pakistan A in the rain-affected final of the Kenya triangular cricket tournament here today. After restricting the Pakistanis to 209 for seven in 47 overs, the Indians reached the target of 220 runs in 44.5 overs. The touring side were bowled out for 318 following on with pace bowler James Anderson taking four for 52. England had to bat again but Marcus Trescothick knocked off the one run needed to win with a four. They have now equalled the England record of seven successive Test wins set in 1928/29 and have also completed 10 wins out of 11 this year, including the 3-0 victory in the Caribbean in April. That betters the nine out of 10 wins recorded by Mike Brearley's side in 1978/79. “I want to create more records. If I get the required support, I will definitely continue my water expeditions,” the 34-year-old swimmer told PTI here. Chowdhury, who crossed the Palk Strait with a timing of 13.52 hours yesterday, said she would begin her preparations for the next expedition after recovering from exhaustion. The four legendary figures, who have contributed in taking golf to the status it enjoys in the country today, and Ashok Kumar, the 22-year-old who won the Order or Merit crown during the 2003-04 season, were felicitated at a function held here. Rohtas Singh, popularly known as “Guruji” on the Tour, has more than 100 titles to his credit in a career. Noted amateur Amit Luthra, the man behind the success of Ashok Kumar, collected the trophy on behalf of Ashok, who is now playing in Tianjin Teda Open in China. The players were honoured by Mr Abhijit Sarkar and Mr Uttam Kumar Bose of Sahara India Pariwar, and president of the PGAI Arvind Khanna. The winners established a commanding 5-0 lead in the first half. Orissa also moved into semifinals, defeating Karnataka 3-0 in the second quarterfinal after leading by a goal at the lemon break. Jharkhand girls dominated the proceedings though Madhya Pradesh did force five penalty corners. The Madhya Pradesh girls got their solitary goal through a penalty corner in the 64th minute by inside right Aradhana. Dr N.S. Sodhi, area director, Special Olympics Bharat, Punjab Chapter, said the workshop would help strengthen the movement of special olympics in the state. Mr Noel Phillips, National Director, Special Olympics Bharat, New Delhi, was the chief guest. He said special zonal Olympics would be organised during August and September. The seventh Punjab State Special Olympics would be orgainsed at Sant Harchand Singh Longowal Institute of Engineering and Technology, Longowal, on November 6 and 7, he added. More than 400 mentally challenged children were expected to participate in it.